US economics is extremely predictable. It doesn’t matter who is President and what party he comes from. Because every president will spend more money than the US can afford. 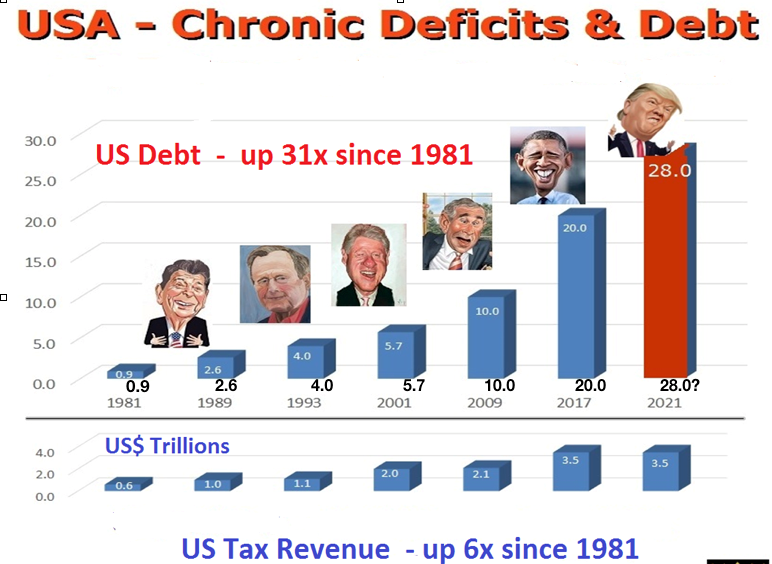 On average, US Federal debt has doubled every 8 years since Reagan came to power in 1981. And Trump has just fulfilled the prediction. The budget deal that has been agreed is guaranteed to produce substantial deficits in coming years. The current year’s deficit might be just under $1 trillion but thereafter it is virtually guaranteed that the US will not have a budget deficit under $1 trillion for many, many years. During Bush Jr, debt went form $10T to $ 20T. Whether Trump will manage to keep it below $28T by 2021 is questionable. What is more certain is that by 2025, whoever is president, debt will most certainly fulfil the historic trend of doubling every 8 years. That means a $40T debt in 2025. The scenario to cause this huge debt is straightforward. Crashing bond and stock markets, high interest rates, high inflation leading to hyperinflation and defaults in the financial system. All that will result in massive money printing on a scale that has never been done in history. It would actually be a miracle if the US debt is only $40T in 2025. With hyperinflation, it could be multiples of that sum. The signals that the markets have given in the last few weeks are a clear indication that the euphoric stage of the economy is coming to an end. It began with the biggest bubble in history starting to burst – Cryptocurrencies. In one month the market cap of this market more than halved from $835 billion to $395 billion. Cryptos have been a wonderful speculation for the few that managed to cash in. But for many it has been a disastrous Ponzi scheme that will end in tears. Cryptos have nothing to do with real investments and even less to do with wealth preservation. There is nothing wrong with having a small flutter in a speculative instrument. Sadly though, many buyers of cryptos have been tempted to buy on credit and are sitting on major losses. The fall in Cryptos is symptomatic of the end of an era. 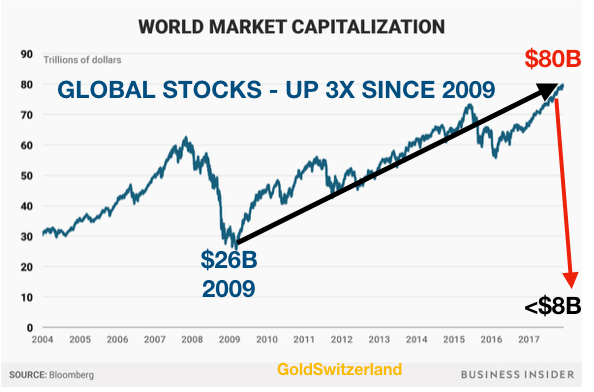 Compared to $80 trillion global stock markets, cryptos are insignificant. Stocks and cryptos have one thing in common, they both have a long way down from here. Whilst cryptos will go to zero, stocks will go down in real terms by at least 90%. I say real terms because hyperinflation can take the nominal level of stocks a lot higher. Between 1929 and 1932 the Dow fell by 90%. On any criteria, the stock bubble is so much greater today so once this market has topped, the coming fall will shock the world. Stock market investors have had the most fantastic ride for over 100 years. $100 invested in 1913 when the Fed was created would today be worth $2.8 million. That assumes all dividends reinvested and no tax paid. This is a remarkable return and only achieved thanks to a group of bankers who decided to take control of the Western world’s financial system in 1910 on Jekyll Island. This was one of the most remarkable financial coups in the financial history for the world. As the famous banker Mayer Amshel Rothschild said over 200 years ago: “Permit me to issue and control the money of a nation, and I care not who makes its laws”. Since the Fed was created in 1913 for the purpose of controlling the money, Global Debt has gone from virtually nothing to $250 trillion today. Add unfunded liabilities of $250 trillion and derivatives of $1.5 quadrillion and we are looking at a total risk for the world economy of $2 quadrillion. Governments and central banks have mortgaged the future for generations to come. Nobody must believe that this money will ever be repaid or that the liabilities can be met. Thus, there will not be an orderly outcome of the greatest financial bubble in history. Central banks are now reversing their expansionary policies. The combination of tapering and interest rate hikes are guaranteed to pop the bubble. The global economy is totally dependent on their daily dose of fresh money and zero interest rates. A 1% increase in interest rates would according to the US Treasury’s Office of Financial Research (OFR) lead to a bloodbath in the US high-grade bond market. This would then spread to junk bonds, fixed rate mortgages and derivatives to further spread the crisis. A rise in rates will also affect the offshore dollar funding market which has risen 5 fold this century to $10 trillion. With over Yen 1 quadrillion in debt, Japan could not survive rates rising above zero. The OFR Stress Index below is a daily market based snapshot of stress in global financial markets. It is constructed from 33 financial market variables such as yield spreads, valuation and interest rates. The index is now at a similar risk level as before the 2007- 9 financial crisis.